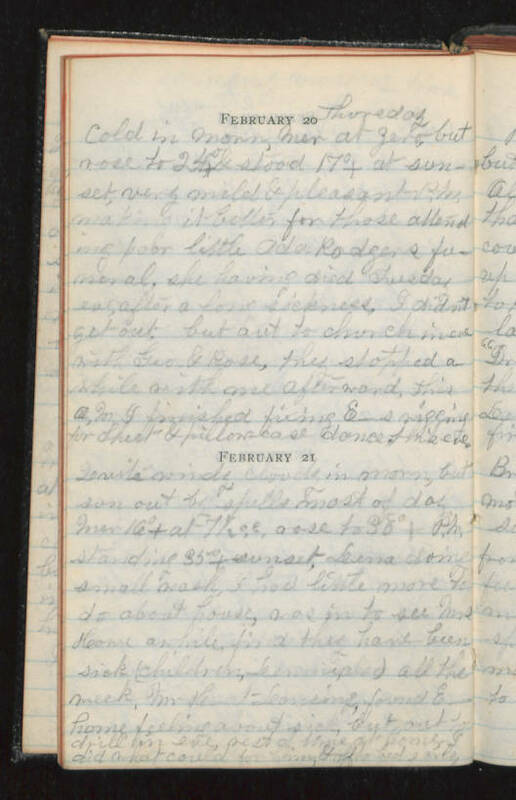 February 20 Thursday Cold in morn, mer at zero, but rose to 24 degrees and stood 17 degrees plus at sunset., very mild and pleasant- plus making it better for those attending poor little Ada Rodge's funeral, she having died Tuesday after a long sickness. I didn't get out, but out to church in one with Leo and Rose, then stopped a while with one afterward, this AM I finished fixing....for sheet and pillowcase dance this eve. February 21 ....windy and cloudy in morn, but sun out by spells most of day. Was 16 degrees at three, rose to 38 degrees PM, standing 35 degrees at sunset, Leina did small wash, I had little more to do about house, was in to see Mrs Heome awhile, find they have been sick (children, ....) all the week....found E home feeling about sick but out to drill in eve....did what could for him.